The Casper Troopers take the field during the Big "V" Invitational, July 2, 1973 in Milwaukee, Wis. Though finishing at the event tied in score with Santa Clara Vanguard (79.15), a one-tenth penalty assessed to the California corps made Troopers the competition's champion. Finishing behind the two Western corps were a number of Midwestern powerhouses including the Blue Stars, Kilties and Madison Scouts. Vanguard would exact its revenge back in Wisconsin 46 days later, however, holding off the Troopers at the DCI World Championship by a score of 88.65 to 88.15. Troopers' second-place finish at that summer's Finals in Whitewater, marks the corps' best finish in DCI World Championship history. 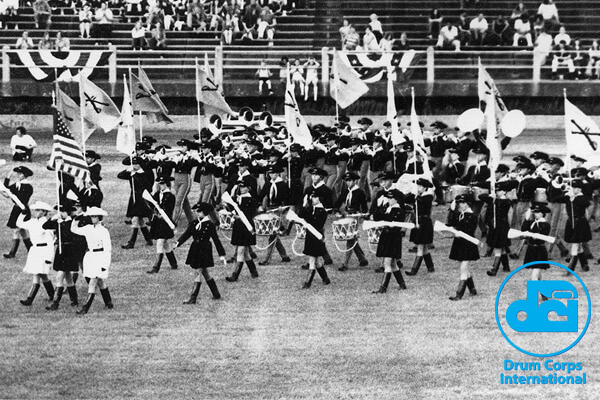 Photo from the Drum Corps World archives. Scanning and archival services provided by Drum Corps International corporate partner WeScanFiles.com.